Hayek intended his writings to serve as a wake-up call to defenders of liberalism. When such defenders took actions in support of private property, Hayek was unashamed in his support for them. 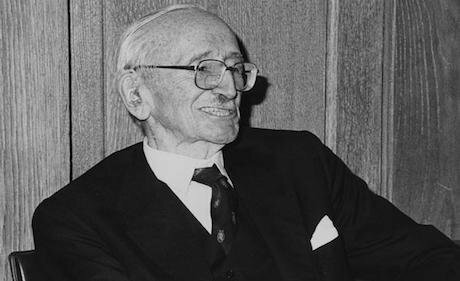 Friedrich Hayek. LSE Library/Flickr. Some rights reserved. It is increasingly common to read about the erosion of democracy under neoliberalism. From the rise of the ‘surveillance state’, to the corporate capture of politics, to the proliferation of international agreements designed to restrict sovereign state decision making, to a political ‘common sense’ that places ‘the market’ at the center of political decision making, political democracy is under attack. To be sure, there are limits to democracy under capitalism. It does not extend into the private economic sphere: Firm owners and managers are free to sack their workers, but the reverse is not the case. Nevertheless, political democracy is ideologically defended and promoted across most of the political spectrum. Despite such proclamations, and hand in hand with neoliberal economic policies, an erosion of democracy is occurring under the guidance of elected politicians across many of the advanced capitalist countries. I suggest that the work of Friedrich Hayek is part and parcel of conservative neoliberal 'common sense'. His ideas justify the erosion of democracy under capitalism in defence of private property. In his influential article The Principles of a Liberal Social Order published in 1966, at the high point of Euro-American Keynesianism, Hayek outlined the relationship between liberalism and democracy. He makes a strong normative case for the primacy of the former, and the potential elimination of the latter. The article also outlines the needs for very strict limits on the parameters of electoral democracy in ‘normal’ (non-dictatorial) times. Hayek begins by contrasting two traditions of liberalism. The first, his favoured one, emerged in the England of the Old Whigs from the mid to late seventeenth century and was fortified by the theories of Edmund Burke, John Locke and Adam Smith. The second was a continental European product elaborated theoretically by writers such as Voltaire and Rousseau. “[D]erives from the discovery of a self-generating or spontaneous order in social affairs…an order which made it possible to utilize the knowledge and skill of all members of society to a much greater extent than would be possible in any order created by central direction…” (Hayek, 1966). It “arose from the desire to extend and generalize the beneficial effects which unexpectedly had followed on the limitations placed on the power of government". For Hayek, the second, continental tradition of liberalism advanced by writers such as Voltaire and Rousseau points in a fundamentally different direction. There is a straight line from it, to what he labels, the totalitarian politics of the French revolution and modern socialism. Through democratic practice, this tradition attempts to subordinate society to a set of political/normative objectives. Under such conditions, individuals are no longer free to do as they please, and certainly not free to use (or even own) their property in ways they see fit. Hayek argued that this tradition of liberalism “has in effect become democratism rather than liberalism and, demanding unlimited powers of the majority, has become essentially anti-liberal”. Hayek’s concern was to defend the first tradition of liberalism in a global context of increasing state intervention and control over the economy, in which he argued, it was being increasingly undermined. To do so he distinguishes between what are often labelled negative and positive freedoms. The former refers to freedom from constraint, the latter to a process whereby individuals are enabled to fulfil their potential. To secure the first tradition of liberalism Hayek argues that governments must secure negative freedoms, and that they should refrain from attempting to generate positive freedoms for their populations. Negative freedoms require the extension of rules “which… consisted solely in prohibitions from infringing the protected domain of each [individual]”. To promote positive freedoms, that is, to try to shape society to enable individuals or groups or social classes, is to start down the road of totalitarianism. Hayek posits that whilst a liberal market order is paramount, it does not require political democracy: “Liberalism and democracy, although compatible, are not the same. The first is concerned with the extent of governmental power, the second with who holds this power". Hayek identifies the roots of what can be labelled private property-based liberalism as emerging in England following its “glorious” revolution in the mid-seventeenth century. This was a period when the Old Whigs’ political party was politically and ideologically dominant. During the English revolution they had sided with parliament against the King, Charles I, and his feudal supporters. They were opposed to Charles’ attempts to raise taxes arbitrarily. They wanted tax raising powers to be more fully subordinated to parliament, which was itself dominated by the landed gentry. In short, they aimed to limit the state’s ability to interfere in the private affairs, and the property of, the emergent agrarian capitalist class. The Old Whigs sought to justify intellectually the strengthening of private property rights over previous forms of property, including common property. The latter, for example, granted peasants access to public lands, without requiring them to have a defined individual property right over them. Private property in land granted the rapidly expanding landlord class rights to do with the land what they pleased, free from state interference. More significantly, it freed them from any obligations to the peasantry and emerging agricultural labour forces, which had previously worked and depended upon the land for their subsistence. The strengthening of private property in land was achieved through mass enclosures of previously common land, the expulsion of its inhabitants, and its transformation into private property. 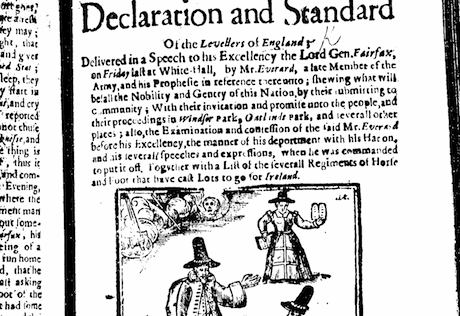 The Old Whigs fought tooth and nail against political organisations such as the Levellers and agrarian socialists such as the Diggers during the mid-seventeenth Century. These organisations aimed to establish equality before the law, equitable land reform and an expansion of public common land. They also aimed to establish political democracy, to ensure the rule of the majority for the majority. Such a system would guarantee that public land (amongst other things) could not be transformed into private property. For the Old Whigs these visions of popular democracy were antithetical to private property. The Old Whig antipathy to popular democracy on the one hand, and support for private property rights on the other, stands at the core of Hayek’s political philosophy. From this starting point he theoretically de-links liberalism and democracy. This move is designed to a) explain how liberalism can exist without democracy, and b) to limit, significantly, democratic influence over a liberal private property based market order. Hayek’s advocacy for negative freedoms over positive freedoms logically limits democratic content. If governments want to guarantee a liberal market order then they must guarantee negative but not positive freedoms. By default then, they are precluded from implementing widespread social programmes designed, for example, to redistribute wealth, power and property towards the poor. These policies would necessitate imposing obligations upon society in order to pursue a designated outcome. Such actions, according to Hayek, represent the first steps towards totalitarianism. Liberal freedoms would be undermined as society is forced to submit to an 'artificial' (i.e. planned) overarching objective, as opposed to benefitting from the free play of the natural, spontaneous market order. Hayek sees liberalism and democracy as potentially compatible. But he also sees the former as compatible with authoritarianism. “It is at least possible in principle that a democratic government may be totalitarian and that an authoritarian government may act on liberal principles”. Liberalism does not, therefore, require democracy. For modern liberals the protection of private property and the ability to do with it what one wishes is paramount, while political democracy is desirable but not essential. “The progressive displacement of the rules of conduct of private and criminal law [i.e. negative freedoms] by a concept derived from public law [positive freedoms] is the process by which existing liberal societies are progressively transformed into totalitarian societies.” (Hayek, 1966). Hayek’s opposition to organized labour was expressed through his support for dictatorships. Hayek later described Allende’s administration as the only totalitarian government in Latin America. He couched his defence of Pinochet in a broader context of supporting democracy only insofar as it contributes to the formation and maintenance of a liberal market order: “In Modern times there have of course been many instances of authoritarian governments under which personal liberty was safer than under democracies”. He offers Salazar’s “early government” in Portugal as an example and suggests that there are many democracies in Eastern Europe, Africa, South America and Asia that fail to protect personal liberty. Hayek influenced Margaret Thatcher, and via her, many contemporary conservative party politicians and ideologues including those at the helm of the current conservative party in Britain. In another letter to The Times entitled “the dangers to personal liberty”, he endorsed Thatcher whilst restating his claim that the marketplace is “indispensable for individual freedom” while the ballot box “is not”. To be sure, conservative neoliberals in advanced capitalist countries such as the UK and USA did not use military coups to undermine democracy. They were able to use the parliamentary structures established during the previous century to do so. The contemporary erosion of political democracy can be consistently defended from a Hayekian position as necessary for the protection of individual liberty, i.e. private property and limited interference by government in the use of that property. For those who support greater democracy, perhaps it is necessary first to understand how antithetical free market capitalism is to democracy. Private property under capitalism implies ownership of wealth and control over the production of it. Once the production and ownership of wealth is removed from democratic control, its owners can use it as a weapon against those who have opposing visions about how it may be used. In the context of never-ending competition, owners of the means of producing wealth have an incentive to continually reduce input costs. When these inputs include human labour, then it is not the labour, but the humans who bear that labour that are reduced in stature. Any attempts by the latter to improve their position can be viewed in Hayekian thought as “vested interests”, better demobilized and repressed by governments. It is also worth re-emphasising that political democracy came about through centuries-long struggles from below. The Old Whig tradition was vehemently opposed to democracy from below. Their opponents, the Diggers and Levellers amongst others, fought for a brilliant vision of democracy, where economic equality was the foundation for political equality. They still provide the foundations of an alternative vision of democracy.